Looking for an excellent, yet affordable, restaurant for your next meeting or lunch date? Who isn&apos;t trying to save money in today&apos;s economy. Luckily, fine dining and a small bill may go hand and hand in one Athens area restaurant. 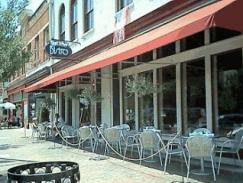 East-West Bistro, one of Athens most popular downtown restaurants known for its fine dining and exquisite meals is now offering a daily lunch special...for five dollars. Consider this, a five dollar meal is less than you would more than likely spend at a local fast food chain--but I promise you it&apos;s on a whole other level at East-West. The "five spot" deal is available Monday-Friday during lunch and is different everyday of the week, leaving plenty of room for second visit--or perhaps dessert? East-West Bistro is located on Broad Street in downtown Athens, stop by and see what the menu offers today--because you already missed yesterday.